This review appears on The Upcoming website here. 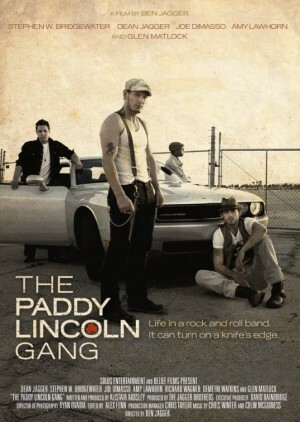 The Paddy Lincoln Gang is a drama about an Irish punk-rock band. Rob McAlister (Dean S. Jagger) is the front man of the band, stuck with a difficult decision to make about the future of the band after a disastrous meeting with a top record label. Steady Eddie (Joseph DiMasso) and Rick (Richard Wagner) – the drummer and the bass player – are getting lazy and uncontrollable and the label have decided to drop the band unless Rob and songwriter Tom (Demetri Watkins) get rid of Eddie and Rick. Rob is also dealing with his own dark past, a past that threatens to explode at any moment. Not knowing anything about the film is probably not recommended. The film’s opening is reminiscent of a horror film, though the majority of the film plays out as a simple drama. The opening was probably intended to give the audience a sense of unease but, unfortunately, it gives the film an unfocussed feel. Almost the entirety of the film feels like build-up, but the film never really delivers. Instead, the majority of the film is taken up with Rob and Tom’s dilemma – what to do about Eddie and Rick – and the film is merely a tame drama about loyalty and music. It is tacky, full of lines about following your heart and letting the music take control – the kind of self-dramatising typical of films about musicians. Glen Matlock has a rather terrible cameo. It doesn’t help that an opening monologue establishes that the band members are pretty unlikeable. Eddie and Rick have few character traits beyond their hedonism and misogyny, while Rob is almost entirely passive. Tom is so shy that it is difficult to imagine him hanging around with these people. There is a long sequence in which the band – apparently the hottest new band to break America – is interviewed for television, but it is wholly unconvincing and awkward. Eventually, there is a twist near the end, which should tie the film together but which instead introduces a totally different – and much more misogynistic – turn to the film. The finished film could be interpreted, begrudgingly, as a story about the pains of the creative process, but really it just seems to be a cheap, tacky drama about loyalty. It is a fairly bland story, messily told with undeveloped characters. The actors are fine, but the film needs a little more thought.